The perfect e-bike for the City or long countryside leisure rides the lowstep frame with 28” wheels gives a lower stand over height that makes getting on and off the bike easier with a commanding riding position and incorporates our Fusion Down Tube that stiffens the frame and delivers a more comfortable ride. 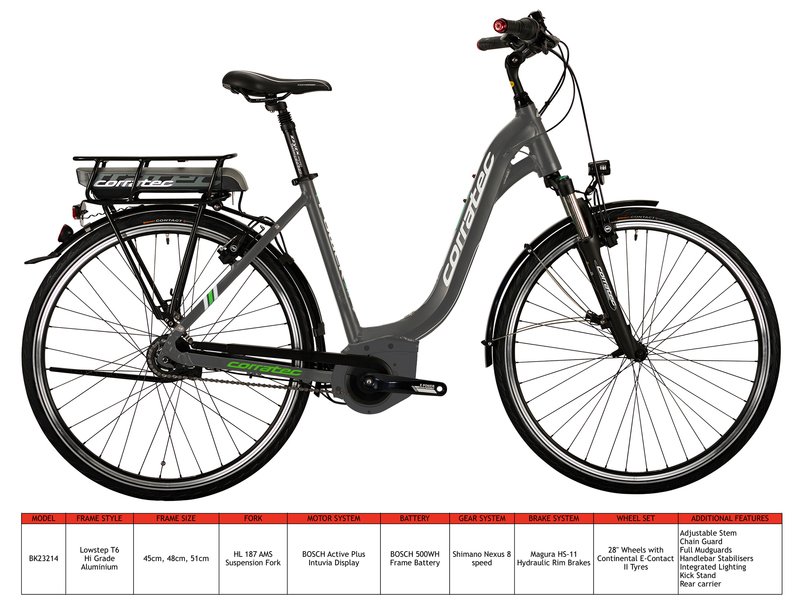 Bosch Active centre drive motor system with a 500wh battery that maximises distances between charges, Shimano Nexus 8 speed hub gears and Magura HS11 hydraulic rim brakes are just some of the highlights of this premium e-bike. Lowstep frame built in T6 high grade aluminium with our reinforced Fusion down tube matched to front suspension forks delivering a smooth and comfortable ride. 28” wheels for a commanding riding position with Continental E Contact II tyres with puncture resistant band and reflective side walls. Industry leading Bosch Active 250w electric centre drive motor system with 4 assistance support levels and full cockpit information read out. Delivering the ultimate smooth controllable e-bike experience. Shimano Nexus 8 speed hub gear system with Revo shifters for smooth effortless shifting in all riding situations. Magura HS11 hydraulic rim brakes for total braking confidence. Full mudguard protection, trekking saddle with suspension seat post, chain guard and kick stand all maximize rider enjoyment. Integrated lighting system, Reflective side wall tyres. All Corratec e-bikes conform with the latest EN 15194 EU Standards. Display: Bosch Intuvia display indicating battery charge status and 4 levels of power support, remaining range, speed and easy start function.